Okay, so here it is…. the fourth track of our TNRC sessions and I gotta say, this one was the most difficult to pull off in an evening for sure. I mean, My Bloody Valentine took two years to make “Loveless”…granted they were making it for the very first time, We were definitely faced with some challenges…for one, recreating history of sorts (technically speaking) is tricky, especially when 19 different studios and a countless number of engineers were involved. Another part of the stress was actually physical…there is such a deliberate aggressive treatment of the sounds in the treble range…like a layer cake of “sheen”…. this wears down your hearing quickly, especially when you’re critically listening. All of this being the case, this process dispelled many of the preconceptions that I originally had regarding MBV. For instance; in my mind (and others that I’ve spoken to about this) It seemed that there were a huge pile of guitar parts tracked to create the Sounds in a song like “Only Shallow”, but when we sat down to analyze what was happening, we found that only four guitar tracks did the trick…and what a trick it is! The key is in the WAY that MBV MVP Kevin Shields plays the guitar. He typically uses a Jazzmaster or Jaguar both of which have the same type of tremolo (whammy) setup. Kevin plays his rhythm guitar tracks while holding the trem bar in his hand. He has perfected this style, and plays very deliberately, plunging the trem down in critical places to create another dimension to the rhythm guitar track. Another illumination was manifested more in the mixing phase where the guitars were mixed very up front and usually panned in stereo as compared to the drums which were in mono (producer Alan Moulder documented the fact that Kevin preferred the drums in the center of the listening field). This contributed to the larger than life guitar sounds. Here is a breakdown of what we did to get an “Only Shallow” guitar sound. 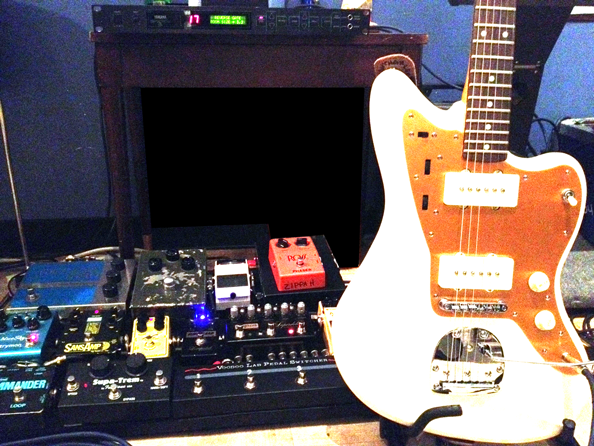 We used a Jazzmaster guitar into a compressor pedal (we used an MXR Dyna- comp) and also an overdrive pedal (hardly distorted at all)… then into a trem pedal set to about an 8th note pulse of our song. This signal was split off (via A/B box set to “both”). And sent to two different amps…a Vox AC-30 and a Marshall JVM 410 with a 4X12 cab. Both amps were set to a “clean” (non-distorted) setting and close mic’d each with their own Sure SM-57. I did my best to play with the tremolo bar in my hand at all times (thanks to Annie for stopping and punching in whenever I’d clumsily pull the bar clear out of the guitar body). We then doubled this track, with the exact same sound and I tried to play as tightly to the original as Possible. These parts ended up being panned as Follows: Vox amps hard left and right and Marshall amps panned just in from the edges but opposite of each other as well. The next track was made using the Digitech Whammy pedal set to an octave up + octave down with the same two-amp setup. Additionally we used a bit more overdrive, a long delay, and also used a Yamaha SPX 90 at the end of the guitar pedal chain set to Reverse Gate (patch #17 for those playing along at home). The parameters were set as follows: type= Reverse, Room Size: 0.1 liveness: 4 delay: 153ms. The SPX unit added a surprising silky top end boost (digital “zing” as I sometimes call it). Two simple bends strategically placed did the trick and the MBV guitar bed was beginning to come to life. The last guitar track was tracked purely in the spirit of the Loveless record…we replaced the SPX with an Eventide H3000 using the “Reverse Shift” algorithm with these settings: L-chan. Length 1399MS, R-chan. Length 1400ms. R&L Feedback 100% R-chan. pitch -1200cents. This “artsy” sound consisted of reversing and pitch-shifting the guitar an octave down (compounded) and delayed. Guitars…done. 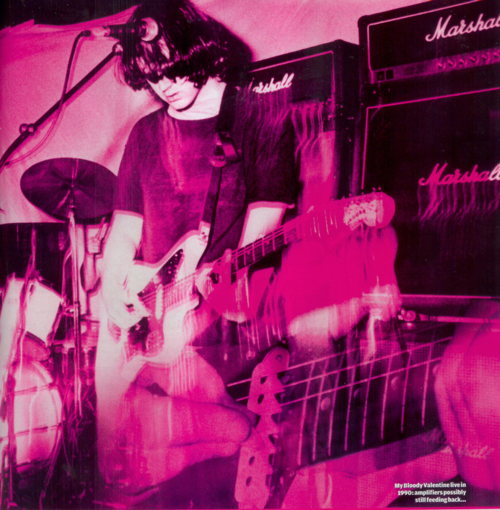 Bass & Drums: MBV used a Steinberger bass in the studio because Kevin liked how consistent it was from string to string. It’s common for basses to have differences in volume, sustain and timbre from string to string. A Steinberger bass is made of graphite and it’s design required special strings that had ball-ends on both sides. I’ve read stores about MBV literally cleaning out stores and distributors to keep a good stock for them. We didn’t have a Steinberger, our bassist this evening (Jim Gilbert) played a ’72 Precision Bass with a pick – patched into a Tone Bender fuzz pedal, and worked to play as consistently (level wise) as possible. We used a Neumann U87 to mic the Ampeg V4 Bass rig (8X8) speaker cabinet. MBV used an 8X10 cabinet. These smaller speakers, when multiplied help to retain clarity while resonating the cabinet for “boom”. We split the bass signal to a direct box, and ran it through a rotary pedal (Multivox Fullrotor), which we brought in at the chorus sections. I deliberately had Jim play in the higher range during the verses, and the lower range in the choruses. The Drums were close mic’d (no ambient room mics) with SM57 on snare top, SM81 on snare bottom Sennheiser MD421 on toms, Rupert Neve/SE RN-17 small condensers on overheads. We used an AKG D112 on the kick drum. There is very little documentation as to the mics that MBV used on the drums, so we went pretty standard. 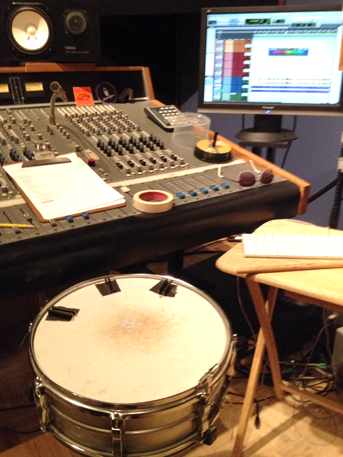 Ryan Dolan (drummer) played a vintage Ludwig Vistalite drum set with a 51/2″ Acrolite snare drum. I tuned and muffled the drums to match what I was hearing on the song “Only Shallow”. In an effort to recreate the sound of the opening snare on “Only Shallow” we followed our suspicion, that they sampled one of the original hits, eq’d it and mixed it in (in the opening fill only) to obtain consistency between the hits. Whether MBV did this or not…it sounds spot-on to me…even the slightly phased quality is there. Snare drum EQ was severe: 4k@ +10, 6k@+9, 1k@-12. We tracked the drums with no compression, but used heavy amounts of parallel compression in the mixing phase…that compressed signal was eq’d separately through a pair of Urei 545 parametric EQs where we boosted a narrow bandwidth of 8k about +4db. I sent varying amounts of each drum set mic (in mixing) to the parallel compressor until I had the right balance of cymbals vs. drums to match the MBV sound. The vocals (Aaron Perrino and Annie Hoffman) were recorded separately, with a soft and dynamically even delivery. MBV used to record Bilinda Butcher’s backing tracks first followed by Kevin Shields’’ tracking. We did the opposite, as the song was brand new to us and Aaron had the best handle on the part. Annie (being the only girl voice in the studio) bravely agreed to sing the 2nd part (I think she did a great job)! Vocals were tracked into a U47 with no compression. In the mix down phase, we applied a de-esser to both vocals and sent them via channel aux send to a (stock) patch called from the Eventide H3000 “Micropitchshift”…we used the SPX 90 “parametric eq”to severely boost top-end ONLY on the send to the Eventide. This helped us achieve the silky vocal eq while minimizing the “essy-ness”. All in all, I feel like we did manage to recreate the MBV “Loveless” sound, and I developed an even greater respect for Kevin Shields for seeing his vision through. Check out the super cool video below produced, edited and directed by Will Claflin aka “Sacruhlicious”. Special thanks to Matthew Hajdys for taking all of the photos and to Ryan Dolan for driving down (and back) from Portland Maine to play the drums. Feel free to download the track “She’s An Earthquake” …for FREE! (Below). Tuesday Night Recording Club – “She’s An Earthquake” from Tuesday Night Recording Club on Vimeo. How much will your next recording cost? Click here to let us know a little bit about your project so that we can help you budget your time and money. An ongoing recording series with Producer Brian Charles & songwriter Aaron Perrino of The Sheila Divine. Each week, they assemble musicians from the Boston Music Scene to create a new song based on recording techniques of a seminal moment in music history. Attention freelance engineers! We have special rates that will allow you to make a living all while getting great results. Click here to get in touch with us! Want to learn the basics of recording in a professional studio environment? The Audio Workshop provides a hands-on approach to learning the basics of recording in a professional studio environment. Click here to get in touch with us to sign up for the workshop. © 2019 Zippah Recording Studios. All rights reserved.